The Ringmaster is the heart of the circus, the performer who introduces each act. They guide and draw the audience into the world of magic and wonder (and creepiness). Sometimes portrayed as commanding animal acts or standing with performers on posters. Often shown in formal dress with a top hat and a tailed jacket! 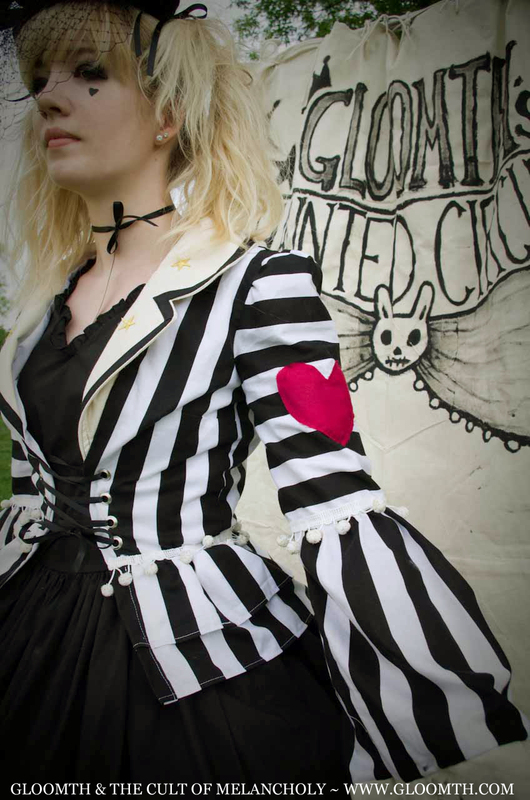 Our “Ringmaster” jacket is the heart of Gloomth’s Haunted Circus line. With the same fit and structure as our popular “Noir” coat it is the perfect finishing touch to your show stopping outfit. Finished with tiny gold embroidered stars on the lapels and a raw edged red heart on the sleeve. We love this jacket!